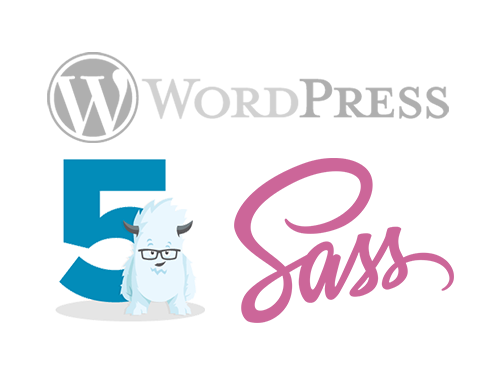 Recently I was working on a very large Drupal Commerce website that required many addresses for shipping (not billing) per customer. The setup of the site was rather unique and required us to create many custom modules utilizing. We also needed a way to create orders on the front end of the site (the shopping cart side) and the back end of the site (the administrators side). One thing that we noticed was that the checkout process on the front end and back end were very different. As a front end user, it’s the pretty typical shopping cart experience, but the backend was very different. Going through the order creation process, we noticed there wasn’t a good way to search for a user. But even if we did manage to reference the user correctly using their email address, we couldn’t select one of their previously user addresses for an order. Enter in the Commerce Admin Order Advanced module. 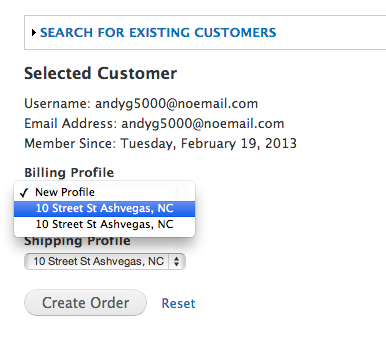 This module was exactly what we needed to search for customers and pick a previously used address that is stored as a Customer Profile in Commerce (and the address book if you’re using the AddressBook module). But right off the bat, we noticed that ever single time we placed and order for a user, their address profile was duplicated. So one customer would have dozens of the same addresses entered into the system. You can see from he screenshot above, the same address is showing in the dropdown twice. In one test, I had at least 20 of the same addresses in the system for one user. So if a manager went to go create an order, the same address was showing up over and over again. This didn’t seem like a very good user experience. The strange thing is that, after we did some research, we realized that the address duplication was default commerce behavior. 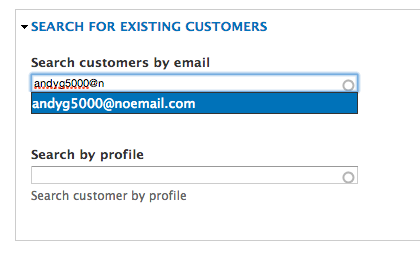 Customer Profiles seem to endlessly duplicate! Our solution was to allow the duplicate address to be created, but if the address is being referenced from an already existing customer profile, the new profile that is created when the order is saved would be set to deactivated.